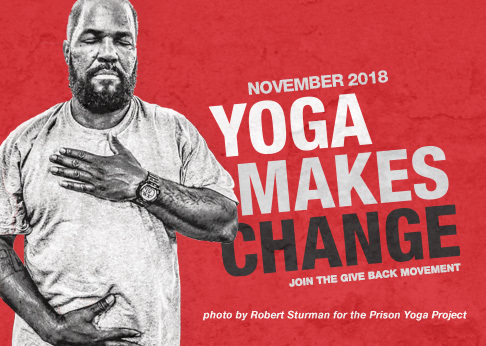 The teacher of my first Integral prenatal yoga training at Satchitananda Ashram shared with us her stories of teaching yoga in a men’s prison. I was in awe listening to her; I felt so much respect for her courage and skill to be able to do that work. I’ve never forgotten her dedication. More recently, I’m motivated to teach new immigrant moms-to-be prenatal yoga for this reason: I’ve become frustrated with yoga, and in particular the structure of the yoga studio environment, and how it can alienate and out-price certain populations who’d benefit from yoga the most. I wanted to turn that self-serving ideal around and put yoga for underserved diverse populations at the forefront, making that the priority in my teaching. And it’s been wonderful! I’ve become more motivated. I understand myself better, know my strengths, and know the populations I have most to offer to. I feel even more strongly that yoga is for everyone. In particular prenatal yoga can be very elitist — available to a certain demographic, and only in yoga studios. In my opinion, all pregnant women should be able to experience the wonderful benefits of prenatal yoga, regardless of income and socio-economic circumstances. There are many beautiful moments; one that stands out is perhaps the first time I taught there. I learned the power of simply closing the eyes. For those in a constant state of hyper-vigilance, simple things we take for granted — like closing the eyes, breathing calmly, and feeling safe — are very important. The guided meditations for bonding with the baby are really special also. It is lovely to see the women really connect to the baby developing inside them, and feel a sense of peace. This is a great question because whenever I go to Parents for Better Beginnings, I ask myself “What will I learn today?” The women have taught me how to modify and adapt yoga for their community, and how the ability to hold the space in a deeper mindful way is more beneficial than teaching a sequence of asanas that they may be too scared to attempt, and may never do again. When yoga is at its true essence, when it is inclusive, accepting, when it is joyful and loving — when it is a circle, not a line — then it can be of benefit in a diverse neighborhood such as Regent Park. When it meets people where they are and adapts to their uniqueness, it touches them and they feel it and know it, whether for a moment, a day, or longer, this can have a positive ripple effect on a community. Individuals in a neighborhood like this one may then begin to know what ‘safe’ means, and understand what even a minute of peace actually feels like for the first time in their lives. One perception of yoga may lead to anxiety, because of the prevalent ideal of perfection that is often associated with yoga, partly driven by the media. This can be a block to teaching (and learning) in a diverse community, as anxiety increases about “getting it wrong.” People may also give up before they start for fear of not being able to do yoga “because it looks hard.” The first thing I share is other aspects of yoga, in particular pranayama; and the benefits in birth and labor. My students are relieved, the pressure is off. This alleviates their worry, and then they begin to enjoy it. What are some of your ideas about, or hopes for, the future of “service yoga” in Canada in the next decade? I hope that “Service Yoga” will continue to grow in Canada in the next decade, and that more teachers will reach out to many underserved populations to offer yoga and mindfulness. I’d like to see more teacher trainings include “service yoga” as a component, with an opportunity to gain Continuing Education Units.